For years, fish have been feeding on tiny pieces of plastic in the ocean, mistaking them for food. These “microplastics,” sometimes thinner than human hair, are now in 85–90 percent of some fish populations, albeit in relatively small quantities, says Richard Thompson, a marine biology professor at Plymouth University. We humans then eat the fish. 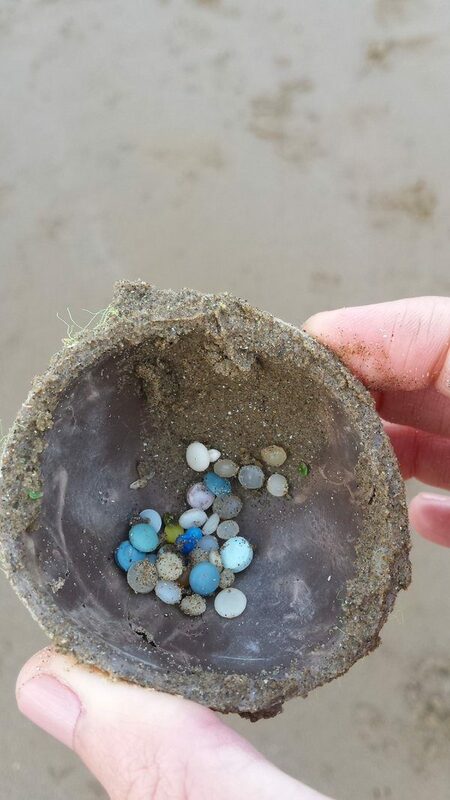 Thompson, who has been studying the effects of plastic waste in the oceans for over 20 years, said the direct harm of microplastics to humans is not yet known. “Scientific understanding of the harm is in its infancy,” Thompson said. And this should worry us, some experts say. In 2014, researchers bought dozens of fish from markets in California and Indonesia. 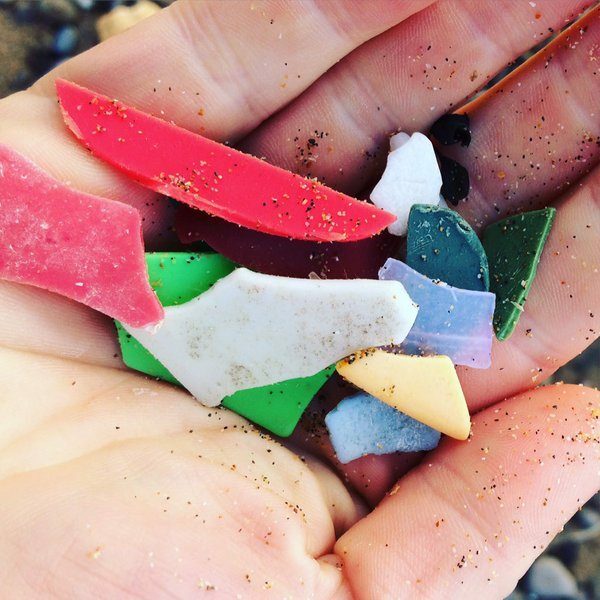 One in 10 Californian fish had plastic in it. One in four from Indonesia did. And a study last month projected that by 2050 there will be more plastic than fish in the world’s oceans. Scientists are researching the harmful effects of chemical additives in plastics and what happens when they leach—such as heavy metals (linked to kidney, lung, and brain damage), bisphenol A (linked to damaging brain and behavior development in children), and phthalates (linked to hindered development of male features in boys). Scientists also found that microplastics act like a sponge and absorb other chemical pollution already found in the water, such as DDT, a pesticide linked to reproductive system damage that was banned in the United States 40 years ago but is still used in some countries, such as China. The extent of the harm these chemical additives and absorbed chemicals can cause to fish, ecosystems, and people is unknown. There are many different kinds of plastic in different sizes, with an array of different additives and absorbed pollutants. “It’s quite a complex thing to try to disentangle,” Thompson said. Moreover, scientists usually need a control group to measure the health effects of something. In this case, a sizable enough group of people who are not already exposed to plastic pollution is increasingly difficult to find. Thompson said people shouldn’t hope for scientific proof that plastic pollution damages human health on a population level. 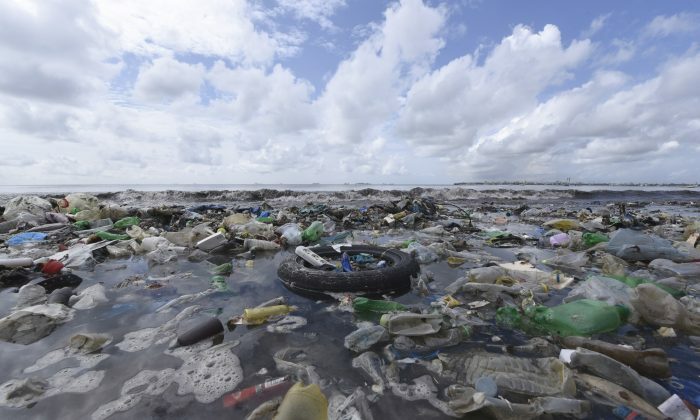 People are exposed to so many other factors in the environment “that isolating the effect of plastic on its own, let alone microplastic, is going to be almost impossible,” he said. One of the foremost authorities on chemical pollution is Rolf Halden, professor at Arizona State University (ASU) and director of the Biodesign Institute’s Center for Environmental Security. Halden studies exactly where the chemicals attached to plastic pollution end up. The research still has a long way to go, but some hints of the extent of the problem are starting to emerge, said Charles Rolsky, ASU postgraduate researcher and one of Halden’s team members. Rolsky said the already known impacts on animals and ecosystems may hint at the impacts on people. “We haven’t yet made this massive connection between them and us but we’re seeing it on a small scale,” he said. And because plastic is everywhere, even a small amount of evidence showing an adverse health effect could signal a huge problem. “The unknown in this case is really, really terrifying,” Rolsky said. 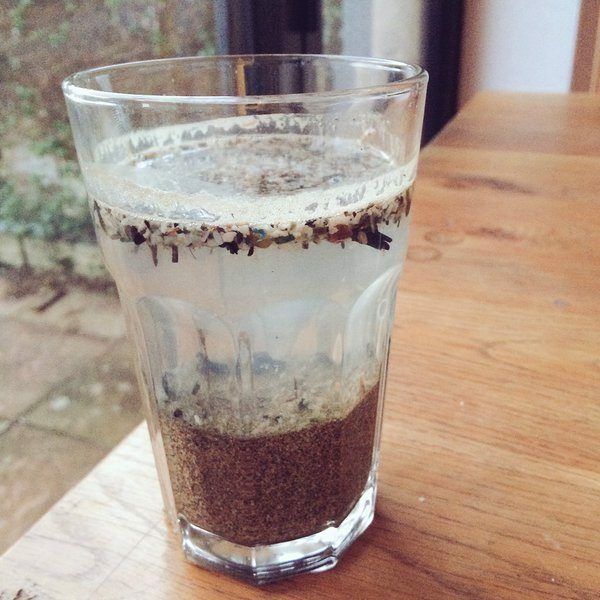 In 2013, scientists fed medaka fish with food containing microplastics collected from the marine environment. Some of the fish developed lesions and symptoms of liver damage. But one impact was most apparent—the fish were starving. The plastic in their stomachs made them feel full, which led to malnutrition. That may hinder reproduction. At least that’s the impact on sea turtles: when they eat plastic, it causes them to become malnourished, and they end up reproducing less or not at all, said Wallace J. Nichols, a marine biologist who has studied sea turtles for some 25 years. “The best research currently available” estimates there are over 165 million tons of plastics in the oceans today, according to a World Economic Forum paper released in January. That’s the weight of over 3,500 Titanics. And people have been adding about 9 million tons—some 190 Titanics—every year. Considering that plastic use is expected to double in the next 20 years, there will be 1 ton of plastic for every ton of fish in the oceans by 2050, the report predicted. 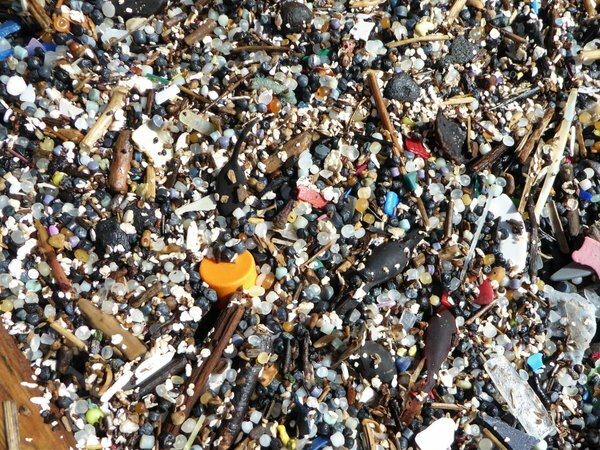 Between 102,000 tons and 260,000 tons of microplastic debris were floating in the ocean in 2014, according to a study published in Environmental Research Letters. They were found on the shores of all inhabited continents, and even in remote areas and the Arctic. 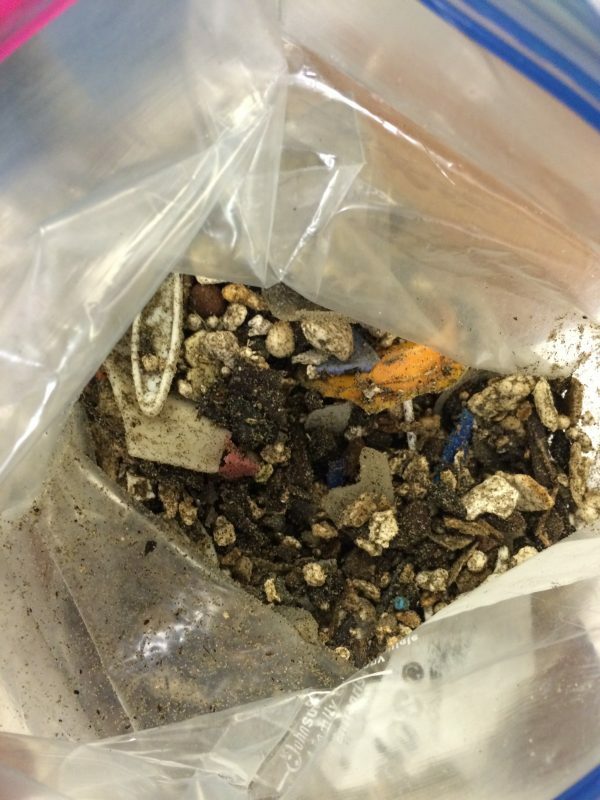 Microplastics can be so small that they flow right through wastewater treatment plants. And because microplastics can absorb chemicals, they may even prevent treatment plants from removing dangerous chemicals from the water. Even worse, the treatment plants themselves use chemicals, like chlorine, to clean the water. Microplastics can absorb these chemicals and carry them out of the plants. A World Economic Forum study suggests that proposed solutions to the microplastics problem should focus on plastic packaging, which makes up more than a quarter of all plastic produced and a major share of the pollution. Most of it is single use. The study authors argue for creating plastics that are reusable to the point where they will “never become waste.” Yet they also acknowledge that’s not feasible with today’s technology. The authors admit it’s unlikely consumers will drastically lower plastic packaging use, but suggest people should still try. Some examples may be bringing one’s own bag to the grocery store, or carrying reusable mugs for one’s morning coffee. But putting the onus on consumers rather than manufacturers is similar to putting the ambulance at the bottom of the cliff. And the lack of direct evidence that plastics harm humans can make it difficult to impose regulations. The pollution problem is partially due to insufficient infrastructure for handling plastic waste. About a third of all plastic packaging produced doesn’t get incinerated, recycled, or sent to a landfill upon disposal. It just leaks through the infrastructure and ends up in oceans, soil, and waterways. “Even under the very best current scenarios for improving infrastructure, leakage would only be stabilized, not eliminated,” the study authors state. Tackling the problem would require global cooperation between plastics industries, governments, legislators, and NGOs, the authors stated. So far, there’s no sign of that happening. The United States passed a law last year banning “rinse-off” cosmetics from containing microplastic beads—tiny pieces of plastic, used for exfoliation. But that only deals with a tiny fraction of the plastic pollution, at least based on Thompson’s assessment of microbead use in the U.K. In 2012, 18-year-old Boyan Slat asked an ingenious question: Why actively fish for plastic trash when ocean currents can bring it to us? In a TEDx talk that went viral, Slat presented a concept of a passive floating barrier that would skim plastic debris off the ocean’s surface as the water naturally flowed through it. Slat set up The Ocean Cleanup foundation in 2013, and in June this year, the foundation deployed a 100-meter-long prototype of his invention in the North Sea, some 14 miles off the coast of the Netherlands. The final barrier, more than 62 miles long, should be deployed in 2020. The project estimates the barrier will help extract almost 80,000 tons of plastic debris over 10 years. That’s about 8,000 tons a year. In comparison, it took 800,000 volunteers to remove 9,000 tons of trash from beaches and waterways around the world last year, according to the Ocean Conservancy’s International Coastal Cleanup report. The most common type of trash was plastic. Slat’s invention is the most efficient way to counter plastic pollution available, a media representative of the project stated in an email. But there’s a hard pill to swallow: the project will cost an estimated $350 million over 10 years of operation—about $4,500 per ton of plastic. That means it would cost about $40 billion a year to extract the 9 million tons of plastic we’re currently releasing into the ocean every year. And that’s not accounting for the increase in plastic production. Or the 165 million tons of plastic already in the oceans. It would take another more than $740 billion to clean that up. And that’s assuming The Ocean Cleanup can capture all plastic—which it can’t. Its feasibility study says the barrier misses about 20 percent of the pollution, partly because it only reaches up to 10 feet deep. Also, it is not able to capture particles smaller than 2 centimeters (about 0.8 inch), meaning it can’t clean up microplastics. But it can snag the bigger pieces before they turn into microplastics. 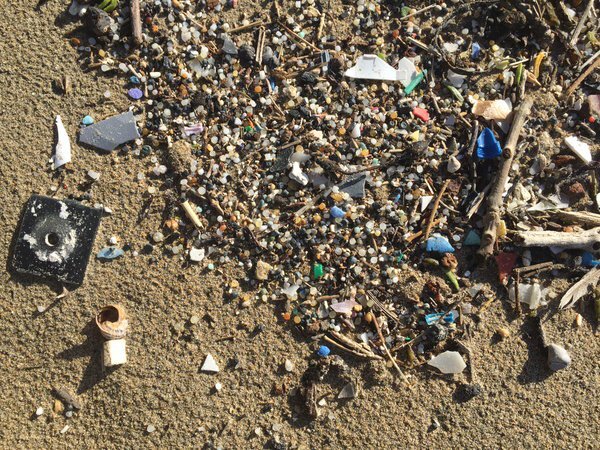 But there were already 102,000 tons–260,000 tons of microplastics in the oceans in 2014. How much more will there be before The Ocean Cleanup launches? Not to mention, the project has no concrete plans beyond 2020, much less any billion-dollar pledges from governments or corporations. Slat likened the plastic problem to a ticking time bomb. The question is, when will it explode? Or has it already?